RVing is a great way to spend time with your family, but sometimes it can be difficult to keep your kids entertained without them being on their electronic devices the whole time. 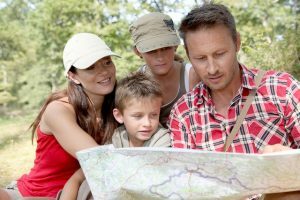 Here are five activities to do with your kids while RVing beyond hiking and exploring the great outdoors. Help them make their own pet rock. Rocks are typically plentiful on a campsite, so why not grab a bucket-full, some paint, and brushes to let your kids make their own pet rocks? Add kooky faces and voila! You have a new special pet – that won’t require feeding – for the day. Fly paper airplanes. Make sure you pack scrap paper to create some paper airplanes. See which one goes the furthest, if any of them can do cool tricks, and whose has the most creative design. Have a scavenger hunt. Send the kids out on a scavenger hunt to help them spend time outdoors. You can download a template from the internet or handwrite the list based on things around you. Build a bird feeder. Birds are abundant at campsites, so consider creating a homemade bird feeder. You can take an orange, cut it in half, and take out the pulp. Then, put two dowel rods through it to provide little stands for the birds. Fill it with bird seed and hang it up with string, then sit back and watch for winged visitors! Have a squirt gun competition. Use some empty solo cups to create a squirt gun competition that mirrors carnival games. See which kid can knock the most cups off the table from a distance or who can make the cup go the farthest. For a reliable, comfortable, convenient RV to travel in, check out the selection at RVs of West Texas.